Most of this site is impenetrable swamp, caught between the banks of Monkey River, miles of beach ridge, inland savannah, and Port Honduras to the South. With so much water around, it's no surprise the best way to explore this site is by river. Strictly speaking, Monkey River is outside the National Park, but the people of Monkey River village are working to communally manage the whole area as one reserve. This is a place for the serious wildlife enthusiast. There is no better chance of seeing big game than here. Its named after the troops of Black Howler Monkeys, that hang out in the riverside forests because of the high proportion of fruiting bushes and trees. But if you are lucky, a trip up river (especially at dawn) may give a glimpse of one of the big cats, or Tapir. There are crocodiles, iguana and turtles too. Trails into the river bank forest are also good for birds. The village itself has a fascinating history, and eco-tourism is being used in an attempt to stave off its decline. 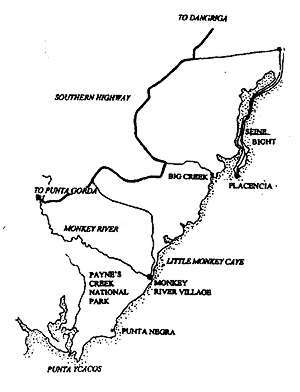 Monkey River village can be reached either by road, from the Southern Highway, or by boat from Placencia. The road is only suitable for 4-wheel drive vehicles only. Tours to Monkey River are run from Placencia, but be sure they pick up a Monkey River guide as they know the area much better. Any time, although there are fewer bugs in the dry season, and more animals come to the river to drink. Accommodations are available in Placencia, but to get the best out of the area, overnight at Monkey River itself, where there is a guest house suited to the rugged traveler or backpacker wanting to experience life in a small fishing village (basic). Trails have been cut into the surrounding forests, and guides can be hires from the village. The actual park has no facilities, but the trail systems have been established in the riparian forests of Monkey River by the villagers. Punta Ycacos is increasingly used for sports fishing, estimated at 200 people annually. Highlighted under the auspices of the FPMP, this site was designated in May 1994 (SI 43). Its more detailed background is this: In the early 1990's leaders of Monkey River Village, near the northeast comer of the park, began searching for economic development alternatives to arrest a decades-long decline. The Toledo North Fisherman's Cooperative borrowed money (1990) to build 16 tourist cabanas in the village area. Villagers also contacted the Ministry of Natural Resources and the United States Agency for International Development (USAID), with the hopes of obtaining assistance in establishing a protected land base and accompanying development program for locally-based ecotourism ventures combined with traditional smallholder farming and fishing. Due to a complicated land tenure situation in the area, the Minister of Natural Resources decided to utilise the area s a test case of a dormant provision of the Land Subdivision and Utilization Act (McGill, 1994). In October, 1991, he declared a Special Development Area (SDA) (SI 152), In so doing, a process was set in motion that would require formulation of a development/land use zoning plan. The area that is now the park constitutes; about 60 percent of the Monkey River SDA's area. The BCES, under USAID contract, wrote a management plan (1992) for the original SDA, whose area was expanded in 1993. A factor prompting the expansion of the SDA was a proposal by a US developer to develop a cruise ship facility and resort at Punta Ycacos. Part of the SDA to the south of the Monkey River has freshwater and saline swamps, along with pine savannah. In 1993, a public announcement was made by the Minister of Natural Resources that this area would be henceforth known as Payne's Creek Nature Reserve, following preparatory work through FPMP but the ruling party did not pass the Statutory Instrument before elections were held. In 1994, when a Statutory Instrument was finally issued (by Minister Juan of the former opposition party) the designation had been changed to National Park. Whilst its western boundary is defined by a river, the remainder is bordered by generally unsurveyed properties. UTM co-ordinates have been calculated from the best available 1:50000 compilation of the parcels, but may include some discrepancies. A high proportion of the boundary is defined by coastline, rivers and lagoons whose boundaries change. This made lead to some discrepancies over time. The area estimated in the SI is 29420 acres, and when calculated on GIS gives 31676 acres. features, formed from a extensive sequence of storm-built coastal ridges. Hypersaline, saline and brackish lagoons, mangrove, broadleaf forest and savanna. The park is adjacent to Monkey River. The area is an important Manatee breeding ground. It also contains an Ibis nesting site, a Hawksbill turtle nesting site, and a large wading bird population (both resident and migrants). Punta Ycacos lagoon has Tarpon, and there are Howler Monkeys along the Monkey River. Common game species include Brocket and White-tailed deer, and Armadillo. Jaguar have been reported in the area, and Crocodiles have also been noted. There are live vegetation regions in the park. In the north, there is remnants of riparian forest plus extensive secondary growth along Monkey River. A large unit to the south of this is herbaceous marshland. All reports indicate that this area is impenetrable and hostile to human travel, even in the dry season. Special vehicles were employed to penetrate this area by petroleum exploration crews in the 1950's. Further south and to the west is pine savannah and thicket. Pine was cut heavily in the 1950's and 1960's, so there are generally few pine trees left so the landscape consists of grassland with groups of palmetto. The most southern unit is brackish mangrove swamp associated with Punta Ycacos lagoon system. Finally, along the Caribbean shore (mostly on private land outside the park), vegetation is dominated by littoral thicket species such as Cocoplum and Sea-grape. Cashew has colonized some areas, and there are scattered Coconut palms. This is the most extensive stretch of coastline in Belize not lined with mangrove. Monkey River village is located just beyond the northeast comer of the park, a fishing village with a population of 186. Punta Negra is the main permanent settlement on the mainland coast associated with the park, located on its eastern fringe. It is also a fishing village with a population of 55. There are scattered homesteads around New Haven, an isolated boat mooring area with a population of less than 20. Off to the cast, at the tip of Placencia. Peninsula, is Placencia village (population 367) (tourism and fishing), which is in day trip range of the park and Monkey River. Visitors are brought to the site from here for eco-tourism trips. Relief is mostly flat, with elevation ranging from sea level to a maximum of 30 ft. Payne's Creek and the Punta Ycacos Lagoon form a small watershed and outlet system within the park. Payne's Creek is seasonal in nature, rising in the park's interior. It expands during times of high water, sometimes creating lake-like areas of still water. It flows southeast to the mouth of Punta Ycacos Lagoon. Adjacent New Haven Lagoon is considered the best deep water harbour south of Placencia. The area features an extensive series of storm ridges and intervening ponding areas, the only such occurrence on such a scale in Belize, derived from sediment discharged by Monkey River, just to the north of the park. Soils in the pine savannah area are leached and acid, with subsoil impermeability and topsoil saturation in the wet season and low moisture in the dry season. These soils can support only a low biomass regime such as a pine-grass savannah. Soils in the swamp forest region are poorly drained, some with peaty surface layers. Subsoils are saturated and grey (King, et al. 1986). Rainfall is approximately 97 inches annually at Monkey River. Climate is influenced by the trade winds; southeast trades predominate from February to September, northeast from October to January The rainy season is usually May through January peaking in July. Average annual humidity is 80% Monthly mean maximum. temperature varies between 27C and 31C from May to December. Monthly mean minimum varies from 17C in February to 22C in June. Average daily bright sunshine is 6 hours in the dry season and 3 hours in the rainy season. There are Maya sites under Punta Ycacos lagoon, believed to be associated with salt manufacture. These sites are now underwater due to sea level rise over the last one thousand years.